Using ESA’s XMM-Newton and NASA’s Chandra X-ray observatories, astronomers reveal that Jupiter’s intense northern and southern lights pulse independently of each other. The study, published today in Nature Astronomy, found that very high-energy X-ray emissions at Jupiter’s south pole consistently pulse every 11 minutes. Meanwhile those at the north pole are erratic: increasing and decreasing in brightness, independent of the south pole. This behaviour is distinct from Earth’s north and south auroras which broadly mirror each other in activity. Other similarly large planets, such as Saturn, do not produce any detectable X-ray aurora, which makes the findings at Jupiter particularly puzzling. “We didn’t expect to see Jupiter’s X-ray hot spots pulsing independently as we thought their activity would be coordinated through the planet’s magnetic field. 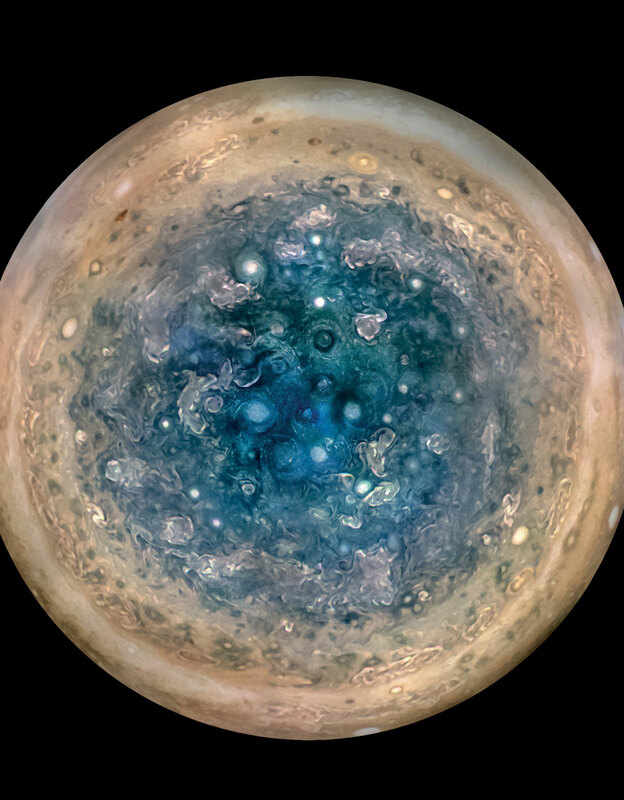 We need to study this further to develop ideas for how Jupiter produces its X-ray aurora and NASA’s Juno mission is really important for this,” explained lead author, William Dunn (UCL Mullard Space Science Laboratory, UK and the Harvard-Smithsonian Center for Astrophysics, USA). Since arriving at Jupiter in 2016, the Juno mission has been re-writing much of what is known about the giant planet, but the spacecraft does not have an X-ray instrument on board. To understand how the X-ray aurora are produced, the team hope to combine the X-ray aurora information gathered using XMM-Newton and Chandra with data collected by Juno as it explores the regions producing Jupiter’s aurora. “If we can start to connect the X-ray signatures with the physical processes that produce them, then we can use those signatures to understand other bodies across the Universe such as brown dwarfs, exoplanets or maybe even neutron stars. It is a very powerful and important step towards understanding X-rays throughout the Universe and one that we only have while Juno is conducting measurements simultaneously with Chandra and XMM-Newton,” said William Dunn. One of the theories that Juno may help to prove or disprove is that Jupiter’s auroras form separately when the planet’s magnetic field interacts with the solar wind. The team suspect that the magnetic field lines vibrate, producing waves that carry charged particles towards the poles and these change in speed and direction of travel until they collide with Jupiter’s atmosphere, generating X-ray pulses. Using the XMM-Newton and Chandra X-ray observatories in May to June 2016 and March 2007, the authors produced maps of Jupiter’s X-ray emissions and identified an X-ray hot spot at each pole. Each hot spot covers an area much bigger than the surface of the earth. Studying each to identify patterns of behaviour, they found that the hot spots have very different characteristics. “The behavior of Jupiter’s X-ray hot spots raises important questions about what processes produce these auroras. We know that a combination of solar wind ions and ions of Oxygen and Sulphur, originally from volcanic explosions from Jupiter’s moon, Io, are involved. However, their relative importance in producing the X-ray emissions is unclear,” explained co-author Dr Licia Ray (Lancaster University). “What I find particularly captivating in these observations, especially at the time when Juno is making measurements in situ, is the fact that we are able to see both of Jupiter’s poles at once, a rare opportunity that last occurred ten years ago. Comparing the behaviours at the two poles allows us to learn much more of the complex magnetic interactions going on in the planet’s environment,” concluded co-author Professor Graziella Branduardi-Raymont (UCL Space & Climate Physics). The team hopes to keep tracking the activity of Jupiter’s poles over the next two years using X-ray observing campaigns in conjunction with Juno to see if this previously unreported behaviour is commonplace. The UCL and Harvard-Smithsonian-led study also involved researchers from Lancaster University, University of Southampton, NASA Marshall Space Flight Center, Universite de Liege, Boston University, Southwest Research Institute (SwRI), Jet Propulsion Laboratory, Caltech, MIT and Universidad Pontificia Comillas. It was kindly funded by the Science and Technology Facilities Council (STFC), ESA, the Natural and Environmental Research Council (NERC) and UCL. Be the first to comment on "New Research Shows Jupiter’s X-Ray Auroras Pulse Independently"